These two late-period Powell and Pressburger films come from very different phases of their filmmakers’ careers. Oh Rosalinda!! was made towards the end of The Archers’ great collaboration, with only two less-than-inspired war stories following it. Years later the team united for one last outing, the Children’s Film Foundation production of The Boy Who Turned Yellow (though Pressburger also worked under a pseudonym on the script of They’re a Weird Mob). Made when The Archers still commanded considerable prestige, Oh Rosalinda!! was a notable box office and critical failure, helping precipitate their later split. Powell and his collaborators were seemingly embarrassed by the film, although all contributed handsome effects and elements to it. Adapted from Johann Strauss’ Die Fledermaus, but updated to post-war, four powers Vienna, the film was an attempt to resurrect the operetta film, a genre moribund since the 1930s. 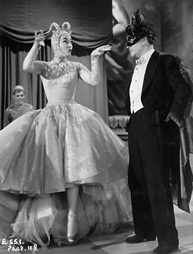 It can also be seen as completing a trilogy begun with The Red Shoes (1948), with its film-as-ballet sequence, and continued and expanded by The Tales of Hoffmann (1951), which fused opera with ballet and did away with conventional dialogue altogether. Oh Rosalinda!! backs away from such experimentation in its screenplay, arriving at a balance of song and talk similar to the conventional musical. Nevertheless, in its visuals Oh Rosalinda!! is easily as avant-garde as the previous films. Of all Powell and Pressburger other films, only A Matter of Life and Death (1946) shows a similar fondness for cinematic gags evinced by this film. Hein Heckroth’s elaborately unreal décor is a joke in itself, sometimes insanely gaudy, sometimes achieving a theatrical beauty, with madly stylised touches – like the scene shot at a 90 degree angle, with the vertical and horizontal planes playing each others’ usual role, so that the studio floor becomes a skyline and the studio wall becomes the ground (see Cocteau’s Orphée, 1950, for a more stately version of this technique). In one sequence, Powell vividly simulates a character’s drunken double-vision, filling his CinemaScope frame with double versions of every prop and even one character (adding to the hilarity, the “twin” actor in no way resembles his doppelganger). So the film has much to offer in the way of visual splendour and silliness, and is rich in performance too. Part of its camp appeal is to surround the titular flirt, Ludmilla Tcherina, with the cream of British gay and bisexual acting talent (like a Carry On film with a budget and artistic aspirations). Tcherina can’t act in any conventional sense but, like Maria Montez, everything she does has the conviction of her Technicolor beauty behind it. When, in one scene, her husband starts to strangle her and she makes a throttled expression and sound before he’s actually laid hands on her, it seems not so much a mistake as a piece of inspired comic timing. But topping the bill is Anton Walbrook – a great star of Powell and Pressburger movies – in a perfect role. The Bat combines two other classic Viennese characters: Harry Lime, as incarnated by Orson Welles in The Third Man (Carol Reed, 1949), and Walbrook’s own ringmaster figure from La Ronde (Max Ophuls, 1950). Thus, The Bat is a black marketeer who can get anything you need as long as you don’t mind how he does it. He is also a master manipulator of other people’s love-lives. Walbrook plays him with an insinuating charm that sometimes borders on the overwhelming, but it’s a mesmerising turn. Powell’s reputation doesn’t benefit from over-hyping his every film – he made enough sheer masterpieces that one needn’t overrate his lesser films in order to assure his place in the pantheon. But I have a soft spot for Oh Rosalinda!! It’s rarely seen, and any big-screen outing is a must for fans of The Archers. It’s lurid, empty, at times vulgar, but also inspired, vivacious and fearless in its abandonment of reality and embracement of kitsch. A delight. 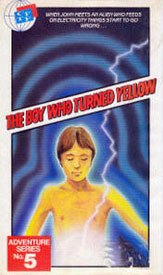 The Boy Who Turned Yellow boasts a script by Emeric Pressburger, and is Powell’s last dramatic film. While restrained by its budget and by its own ambitions, it does feature some impressive and surreal set pieces, such as the yellowing of an entire London Underground train and its passengers, and a journey into the magical world of television. Pressburger’s story is quite free-form and rather lacking in logic, even for a fantasy, starting with a trip to the Tower of London and a lost mouse, before leaping this way and that through different fantastical ideas – like a whole television series spliced together by a hyperactive child. If you don’t ask for too much structure, the film has much to offer in the way of typically Pressburgian whimsy and unfettered imagination. Powell’s camera is more static than usual. This is more likely the result of time and money constraints than any lack of energy on his part, but he shepherds his resources and pulls off some charming special effects sequences, continuing an interest in representing the impossible which can be traced back to The Thief of Bagdad (1940) and A Matter of Life and Death. It also features one member of the old stock company, returning for a final bow in a Powell film: Esmond Knight, who had appeared in numerous Powell and Pressburger films despite being blinded in World War II, appears as the family doctor. One face from the future is introduced as well: the hero’s American schoolmate is played by a juvenile Lem Dobbs, future screenwriter of Steven Soderbergh’s Kafka (1991) and The Limey (1999). Whatever its weaknesses, the film far supersedes other Children’s Film Foundation Productions in scope and imagination. The film did extremely well with its audience and could have led to further work, but sadly Powell quarrelled with members the board of the Foundation, and no further children’s films followed from The Archers. That further films were not made possible for this titan of British cinema, and that the British film industry forgot him so comprehensively through most of his later years, is a national disgrace. But Powell left behind an unrivalled body of marvellous work stretching from The Edge of the World (1937) to Return to The Edge of the World (1978), taking in half a dozen absolute masterpieces of cinema, and two fine volumes of autobiography which are witty, poetic, insightful, and sometimes even factual.